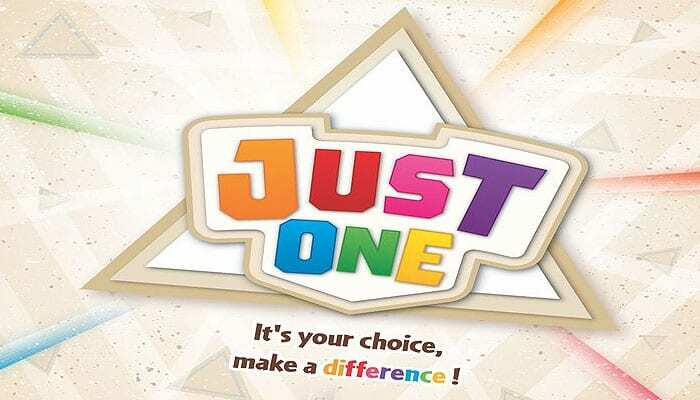 Just One is a cooperative party game. You all play together to get the best score! Together, make one of the players - the active player - guess a Mystery word by secretly writing a clue on your easel. Choose your clue without coordinating with each other and be original so as not to write the same clue as ano- ther player, as all identical clues will be canceled before the active player gets to see them. At the end of the game, tally your score based on the number of Mystery words found. Shuffle the cards and randomly draw 13 to create a face-down deck in the middle of the table. Return the remaining cards to the box, they will not be used this game. Give an easel and an erasable felt marker to each player. Randomly choose a player to be the first active player. The game plays out in a succession of turns and ends when the deck of cards is empty. The active player draws the top card of the deck without looking at it, and places it on their easel so that all of the other players can see the words (one of the sides of the easel has a support to hold the card). 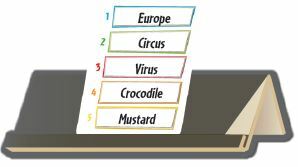 The player then chooses a number between 1 and 5 to tell the other players which Mystery word they have to provide a clue for. Note: If players don't know the chosen word, they can ask the active player to choose a different number. 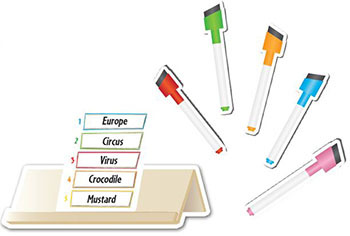 Without communicating with each other and without showing it to anyone each player writes one clue on their easel. That clue must be composed of a single word. Note: a digit, a number, an acronym, an onomatopoeia, or a special character are all considered to be words. Example: 007 is allowed to help someone guess Bond, just like Riiiiiinnng or SMS are allowed to help someone guess Telephone, and $ is allowed to help someone guess America. The Mystery word but written differently. Example: Shurt is not allowed when trying to make the player guess Shirt. The Mystery word written in a foreign language. Example: Buisson is not allowed if the word to be guessed is Shrub. A word from the same family as the Mystery word. Example: Princess is not allowed if the word to be guessed is Prince. Example: Swee'ting is not allowed to try to help someone guess Cake. A word phonetically identical to the Mystery word, but the meaning of which is different. Example: Whether is not allowed to try to get someone to guess Weather. Once all players have written their clues, the active player closes their eyes. During this time, the other players turn their easels around and compare their clue with the other players. All identical or invalid clues are cancelled. To cancel a clue, simply tip the easel over to hide the clue. Example: Mouse and Mouse are identical. Variants from the same word family. Example: Prince and Princess are considered to be identical. Variants of the same word: plurals, gender differentiations, and spelling mistakes don't count as actual differences. Example: Prince and Princes, Actor and Actress, Philosophy and Filosofie are identical. Note: If all clues have been cancelled, place the Mystery word's card back in the box and move directly to the End of turn phase. Once the identical or invalid clues have been cancelled, ask the active player to open their eyes and try to guess the Mystery word with the help of the remaining clues. To do this, they're allowed ONLY ONE GUESS. If the active player correctly guesses the Mystery word: place this card face up next to the deck. If the active player makes a wrong guess : return this card AND the top card of the deck to the game box. If the active player chooses not to answer and skips their turn : return this card to the game box. If the active player's guess has the same pronunciation as the Mystery word, that guess is considered to be valid. If the player gives a wrong guess during the final turn, also remove a card previously guessed successfully. The player to the left of the active player becomes the new active player. A new turn begins. Note: make sure to properly erase your old clue between turns. The game ends when the deck is empty. 13 Perfect score! Can you do it again? 12 Incredible! Your friends must be impressed! 11 Awesome! That's a score worth celebrating! 9-10 Wow, not bad at all! 7-8 You're in the average. Can you do better? 4-6 That's a good start. Try again! 0-3 Try again, and again, and again. During setup, players each take two easels. During the choice of clues, they write one clue on each of their easels. Each player therefore provides 2 clues instead of a single one. Identical clues are also cancelled during the Comparison Phase of clue selection.